Presbyterian Homes’ Lake Forest Place is one of the premier independent living Life Plan Communities on Chicago’s North Shore. 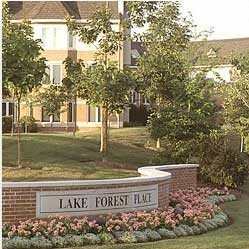 Located on 60 beautifully wooded acres, Lake Forest Place offers flowering gardens, lush green lawns, delightful walking paths and beautifully detailed residences – all just minutes from downtown Lake Forest and the Lake Michigan shoreline. This extraordinary senior living campus, combines an upscale ambiance with a true sense of neighborliness, and offers endless opportunities for social engagement and recreation. Better still, it all comes backed by Presbyterian Homes’ renowned continuum of care. At The Highlands assisted living you'll find unique residences designed for those who may need some help with some aspects of daily living. In addition, our continuum offers a high-rated and accredited rehabilitation and skilled nursing services, as well as specialized memory care.